Yuan Shao can use two hand cards of the same suit as hail of arrows. King Ability: Yuan Shao's maximum hand limit is increased by two for every other living hero. Yuan Shao's "Bloodline" does not let him hold two extra cards for him still being alive. He only gets two cards for each other hero character in play. Yuan Shao is one of the few characters that can start a self-perpetuating cycle. As he kills rebels, he draws three cards. So long as he has two cards of the same suit, he can continue to use his power and kill more rebels to perpetuate the cycle further. Yuan Shao's "Random Strike" targets everybody, including his allies. In addition, characters with retaliatory powers will be able to target him each time he hurts them when using this power. "Bloodline" is a weak king ability. Yuan Shao will rarely have extra cards to store at the end of his turn. 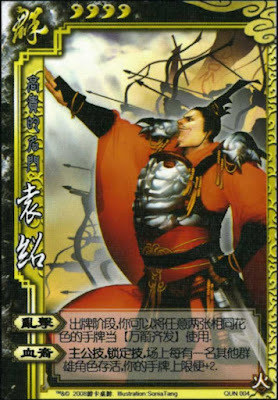 Cao Cao - Cao Cao gets both cards when Yuan Shao uses two cards to activate One Thousand Arrows and hurts him. This is good for Yuan Shao if they are on the same team, but bad if they are on opposite teams. Sima Yi/Xiahou Dun/Fa Zheng - These characters have retaliatory abilities that will target Yuan Shao each time he hurts them. Chen Gong/Xu Shu - These characters are not vulnerable to Yuan Shao's techniques. Xu Shu cannot be targeted by tool cards (i.e. One Thousand Arrows) and Chen Gong can only be hurt once per turn. Guo Jia/Xiao Qiao/Xun Yu/Cao Pi - These characters can use their abilities to deliver Yuan Shao with more cards each time he damages them with his ability, perpetuating his cycle. King Yuan Shao is a good king. When his loyalists are dead, he has nothing to lose when using his power. In addition, the additional cards that he can hold in his hand for each hero character will keep him alive longer. However, he has to be careful when using his power if his loyalists are still alive. Yuan Shao is a mediocre loyalist. He is good when the rebels are weak and the king has enough health, but when the opposite is true, he cannot use his power without putting the king at risk. Rebel Yuan Shao is a very good rebel, as he can target the king and his loyalists each time he uses "Random Strike." In addition, it is not a bad thing to kill his rebel friends, as he draws more cards to continue his cycle. Spy Yuan Shao is a good spy pick. Since he has no allies, he does not care about who he hurts. He can continue to use his power, killing rebels and weakening the king and his loyalists. He just has to be sure that the king will die last. Yuan Shao is a great character who can be a lot of fun to use. However, when using him, you have to know when to use his power. Use it when your enemies are very damaged and when you can kill rebels to draw more cards.